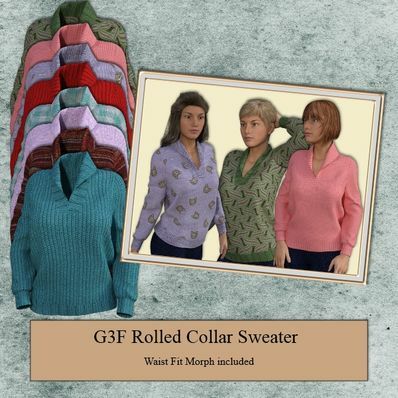 Rolled Collar Sweater for Genesis 3 Female for use in Daz Studio 4.8. "Rolled Collar" is spring 2017 trendy fashion in Japan. It's so cool. Thank you very much! This sweater looks very nice! Thanks a lot, and a Happy New Year! HAPPY NEW YEAR to all with a big thank you for this pleasing Sweater. nice work. Happy New Year! Thank you so much for your ongoing generosity! Really nice Sweater! Thank you so much! This looks like something I'd wear. Nice, thank you. Happy New Year! Something G3F would actually wear! Thank you for sharing! Just stunning, love the rolled collar and the folds look so natural adds so much to the realism of the sweater. The textures are such a wonderful bonus! Happy New Year and Thank You! Something warm for G3F. Thank you. thank you for your generosity and happy new year! Thank you for sharing - a happy new year to you!